Until 2009, the cutting machines residing at Central Cal Metals, Fresno, CA, performed laser cutting—25 machines in all, working alongside complimentary fabricating equipment including press brakes and shears. When business at the third-generation family-owned company levelled off somewhat in 2008, the company welcomed a waterjet-cutting machine into its sprawling 165,000-sq.-ft. home. Waterjet cutting has opened numerous doors in several new markets for Central Cal Metals, including cutting reflective materials such as aluminum (shown here), as well as cutting nonmetals such as plastics and rubber. “We conducted a lot of research into waterjet-cutting technology,” says operations manager Tom Alandt. “We visited several equipment suppliers and brought along sample parts that we asked them to cut, on the spot. We watched how they programmed the parts, and how the machine cut them. And, we asked each supplier to cut the same part profiles from a variety of material types and thicknesses. Much of the early work for its waterjet-cutting machines, says Alandt, was for existing customers. Atop its customer list are manufacturers of automotive-aftermarket parts and suppliers to the aerospace, farm-equipment and electrical industries. Now six waterjet machines, all Mach 3 models from Flow Intl., live here. And, farm-equipment customers for Central Cal Metals’ laser-cutting services now turn to the company to waterjet-cut thick mild-steel plate. When the economy changed in 2008, so did many a job-shop fabricator, including Central Cal Metals. Today the waterjet area of the plant houses four of the smaller machines and two of the 24-ft. machines; all employ 94,000-psi pumps as well as all of the Flow bells and whistles. These include three-side loading with four-sided operator access; the Paser 4 cutting head that enables orifice-assembly changeout without having to replace the entire cutting head; and the FlowNest programming software that features scrap remnant control. Adjusting to smaller lot sizes has led to other operational changes. 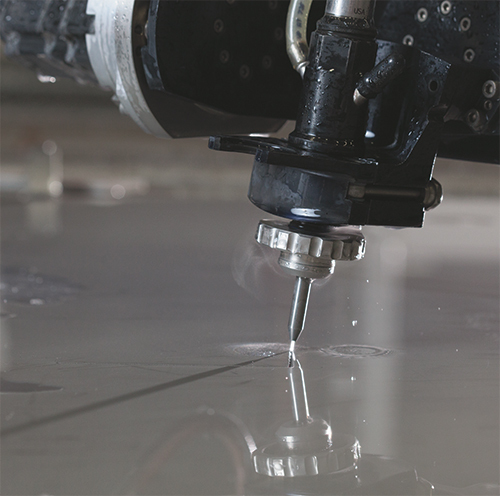 Integrating waterjet cutting into its operations came relatively easy to the Central Cal Metals team, Alandt says. But the learning curve and real trick to optimizing the return on investment has come with learning to handle the complex and challenging jobs that come in the door. One technique the firm has become quite adept at is stack cutting, to optimize throughput. “We can stack large, heavy work,” says Alandt, “to cut two parts at a time. We’ll typically stack material 16 to 7 gauge thick, provided the blanks are larger than 12 by 12 in. With smaller work there’s a chance vibration could impact cut-edge quality and accuracy. Alandt cites one example of such a job—a 3-in.-thick steel part measuring 14.5 in. wide by 96 in. long. The customer needed ½ in. trimmed from the entire length of the part.